I’ve been honored to befriend and work with Barefoot Books over the past year. I’m inspired by the sincerity with which the entire team, led by Barefoot’s courageous and wise founder, Nancy Traversy, approaches their work, from publishing gorgeous, globally-inspired titles like The Barefoot Book of Children, their World Atlas, and countless stories. So, I’m especially honored to join Barefoot and keynote their 25th Anniversary celebration to be held at Nancy’s beautiful, “Barefoot” home in Concord, MA on Saturday, July 15, 2017. This event is OPEN TO THE PUBLIC and offers a chance to meet children’s book authors, illustrators, publishers, educators, brand ambassadors, and lots of other global citizens, in a relaxed, thoughtful, celebratory environment. I hope that many of you will take advantage of the opportunity and join us! 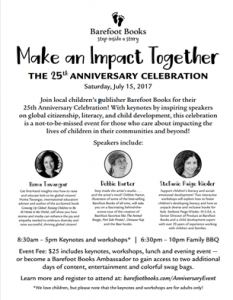 Here’s the link to register (note: Ambassador registration and Saturday guest registration are both here): https://www.eventbrite.com/e/the-barefoot-books-25th-anniversary-celebration-tickets-32294945050. Some topics I’ll address: How do you define global citizenship so that anyone, even if they’ve never left the country, can embrace this idea? How might we respond to a perceived backlash against global citizenship in a spirit of inclusion and kindness? In this session, Homa will shine a light on the power that stories and other media have to enhance our shared humanity — and to guide children to become global citizens who can thrive in the 21st Century.